Graphic intense! Please wait for page to load. Ricky is my only son. 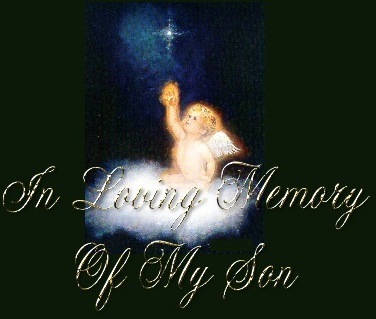 This page is dedicated to my son, Ricky. Ricky was born on June 4, 1979. 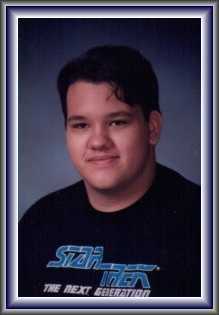 He committed suicide June 6, 1997. He was 18 years and 2 days old. Ricky Is Forever With The Angels And Forever 18! "Suicide doesn't end the pain - It just passes it on!" "We survive.....one day at a time!" Click HERE to hear one of Ricky's favorites songs, "Amazing Grace" played on bagpipes. Click HERE to hear Ricky's favorite song with words, "Windmills of Your Mind". Click HEREto see Ricky's Awards and Gifts. "A gift from Ginny's Angelsas a token of our caring." This Memorial button was made by Angells. From the time he was really little, and on up until his death, Ricky loved Kermit the Frog. He cried when Jim Henson died. We buried Ricky's Kermit with him. But I wanted to make sure Kermit was on this page. So, Ricky, this Kermit is for you! When Ricky was little, he loved clowns! So, Ricky, here are a couple of clowns for you! This Memorial Day, We remember you, Not as a soldier who fought a battle Read about between the pages of our history book, Not as a soldier who fought for his country, For values and a way of life worth preserving. We remember you, As a soldier on the battlefield of life, Valiantly struggling through your own personal war, A war none of us were aware of, And all of us would have taken up arms for in your cause. We would have rallied, given muskets of courage, Canons of patience, barrels of understanding, Rifles loaded with love and compassion, But you didn't let us know we needed to come to your aid, We didn't know you were on the battlefield all alone. The dragons of despair, the monsters of melancholy, The shadows of stress and the presence of pressures, We would have slayed them, we would have lessened their ability To lead you astray from a life full of hope, promise and love. But now we remember you, this Memorial Day, For you valiantly fought a battle Only this family is vaguely aware of. You were our little soldier, our happy, Carefree, confident, companion, We wish we could have helped you, But this was just one battle You had to selfishly fight by yourself. And you've helped us to be aware That we are all here for each other, Through life's joyous occasions As well as the tragic events. We treasure our memories of you And of our times together, We remember you with love, But most of all, We love you and remember you always. God could have stopped you as you picked up the gun, By gently whispering,"It's not your time son". Just willing you to put the gun away And face the challenge of another day. But He knew that your spirit was sadly broken Although the words had never been spoken. He also knew that you were seeking his face And the promise of life in a better place. So as a tear rolled from his eye, He whispered, "I'll just be standing by. I will not encourage nor interfere, Just feel my presence standing near. For with all the miracles I can do, I must leave this choice up to you. If you feel that you just cannot go on, I'll welcome you to your Heavenly home. Though I would prefer that you could stay To follow my life's plan for another day. But I cannot promise all joy and wealth, Or great happiness or robust health. If you do not have the strength to carry on, Maybe it is time to come to Heaven's home". The man breathed a heavy sigh And said, "I can no longer try". As the trigger was pulled he heard a soft voice "It's not my will son--but I accept your choice". Ricky was a very talented young man. He won awards for his artwork. Below is a Star Trek insignia he disigned. The Birthstone below came from Denisse's Escape. Click on it to get your own birthstone. The June angel below and the description That follows it is used with Penny's permission. Thank you very much, Penny! 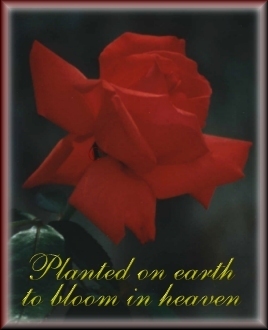 Click on the Angel to visit Penny's wonderful site. The angel of June helps us flourish and grow strong. June's angel teaches us to sustain our enthusiasm for the new projects and directions we started in the spring. In this glorious time of sunshine and growth, we learn to seek out the warmth of friendships and family ties, to help nurture the seeds we planted and become all that we were meant to be. The angel of June urges us to be steadfast in our intentions, to renew our dedication, and to stay the course intended for us. Ricky was born in June. Here is the flower for June. 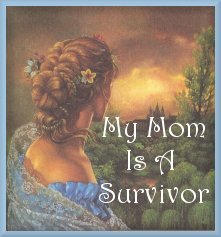 Click here for info on how to join My Mom Is A Survivor Ring. Thank you, "My Mom Is A Survivor" For this beautiful award! We are honored! 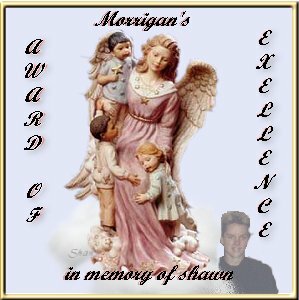 Ricky, this award is from Morrigan. She lost her son, Shawn, to suicide too. I hope you have met him...... Honey, I miss you and Morrigan misses Shawn! Angels In Heaven Visit Josh's Pages, another Angel in heaven. In Loving Memory of Our Daughter Jordan Bailey Please visit Jodi's tribute to her daughter. 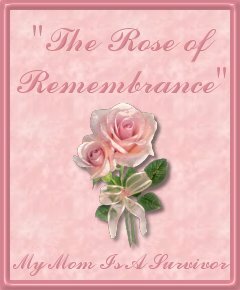 Click this graphic to visit Virginia's Special Angel Virtual Memorial Wall.